India’s state-owned aircraft maker Hindustan Aeronautics Limited (HAL) continues to fall behind schedule in delivering the country’s first domestically designed and produced light fighter aircraft, the Tejas Light Combat Aircraft (LCA), according to information released by India’s Ministry of Defense (MoD) last week. 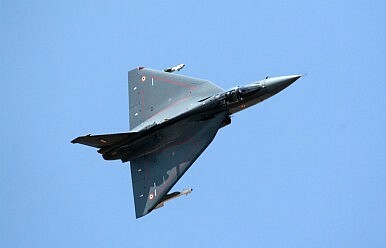 HAL so far has only delivered four out of 40 Tejas Mark-I LCA ordered by the Indian Air Force in 2005. Originally, all 40 aircraft were expected to be delivered by 2018. As of this month, HAL only has 12 additional fighter jets under production. HAL has so far not yet been able to meet the target of eight serially-produced aircraft per year, although it has obtained permission from the Indian government to ramp up production to 16 LCAs per annum in March 2017. Senior Indian military leadership has been aware of delays in the Tejas program for some time. “We are ready to take more — 120 [fighters], six squadrons of Tejas… We are ready to take it as soon as they [HAL] can provide it. That means they have to ramp up the production rate, which is running behind schedule… But we will take all 120,” then-IAF Air Chief Marshal Arup Raha said in 2015. The first-generation Mark-I variant of the Tejas is suffering from a number of technical shortfalls, according to an Indian government report, which purportedly are being addressed. As I reported previously, the IAF abandoned “plans to develop an upgraded Mark-II Tejas LCA and instead will field an improved Mark-I Tejas LCA — dubbed Tejas Mark-IA — in which the technical problems of the Mark-I version outlined in the May 2015 government report will be addressed.” The report was published by the Comptroller and Auditor General (CAG) of India — the Indian government’s principal oversight body. Overall, the Indian Air Force plans to induct a total of 123 Tejas Mark-IA aircraft, next to 40 Mark-Is. In November 2016, the Indian MoD approved the purchase of a first batch of 83 Mark-IA Tejas fighter jets fitted with new electronic warfare capabilities, a new onboard radar system, and increased internal-fuel capacity. The Tejas LCA, a supersonic, single-seat, single-engine multirole light fighter aircraft, has been under development by the Aeronautical Development Agency in cooperation with Indian state-owned military aircraft maker Hindustan Aeronautics Limited (HAL) since 1983. The Tejas is slated to replace the IAF’s aging fleet of MiG-21 and MiG-23 aircraft. Last month, it was revealed that the new aircraft has completed integration of the I-Derby beyond-visual-range (BVR) air-to-air missile, boosting the Tejas’ aerial combat capabilities.The new missile, fitted with a fire-and-forget guidance system, has an estimated range of over 50 kilometers and an estimated speed of Mach 4. The IAF is also mulling procuring an extended-range variant of the I-Derby with a range of up to 100 kilometers. The first four Tejas LCAs have been inducted into the Flying Tigers 45 LCA squadron based in Sulur, in the Indian state of Tamil Nadu in the south of the country. They will primarily serve as training aircraft. The test firing “achieved all its planned objectives,” the Indian Ministry of Defense announced last week.